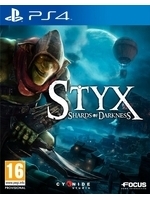 Three new screenshots of Styx: Shards of Darkness to depict the Dark Elves, one of the hostile factions the goblin assassin will have to face. The stealth game from Focus Home Interactive and Cyanide Studio will release later this year. Never played through the first, is it worth a play through if you have very limited time to play games and need to be selective?